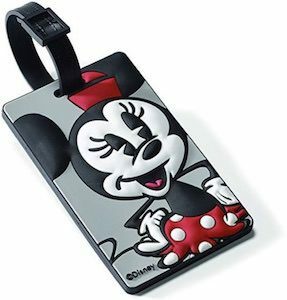 Now you can have a Minnie Mouse Luggage Tag on your suitcase or backpack which makes it fun and lots easier to find your luggage. This Disney luggage tag shows a picture of Minnie Mouse on the front and she shows some attitude with her hands on her hips and her lashes just standing out. The back of the bag tag has an ID card slot so that you can keep changing your address info if needed. A tag like this on your suitcase will make you smile every time you see it and it will make it so much easier to find your bag and makes it way less likely to lose your suitcase. 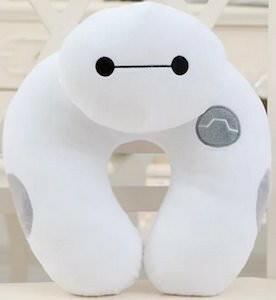 If you like Baymax the fun big white character from the Big Hero 6 movie then you probably going to love this neck pillow. This travel pillow is just like Baymax white and has the same grey spots and a port (not real) and to top it all off this neck pillow has the head of Baymax sticking up. So now traveling will be extra fun when you know that Baymax is there to keep your head up. The Big Hero 6 travel pillow is great for both young and old and great for trips in the car, train or plain. Now there is a suitcase that most kids would love to take. This suitcase is smaller then most but it is for a child and it looks like Lightning McQueen from the hit movie Cars. Yes the suitcase looks like the car and that makes it extra fun for kids. The cars suitcase is a soft-shell suitcase with zipper pockets and it has a retractable handle. 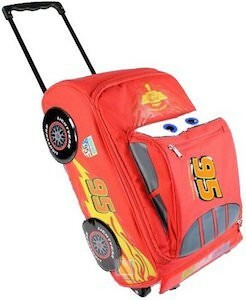 Just imagine you child’s face when they go on a trip using this amazing looking suitcase that looks like their cartoon friend Lightning McQueen. This luggage tag is not the boring square version you most time see. 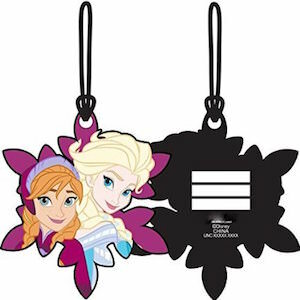 This luggage tag is cut in a flower or snowflake shape and on that you can find the Frozen sisters Anna and Elsa all friendly and smiling. On the back the luggage tag offers plenty of room for information and this luggage tag is perfect for kids. Kids will love it and that means they won’t mind if you put it on their school bag or their suitcase and now you have to worry less of them loosing it all because of this Disney Frozen bag tag. The Disney Pixar movie Inside Out is all about the emotions that live in your head and in the movie they are real characters of witch one of them is Joy. And now you can have luggage tag with Joy on it with he fun blue hair and her green dress she seems happy to travel with you. The bag tag is great for a suitcase, backpack or any other bag. Great for school, work and of course travel. On the front you see Joy and on the back it will have the information you want printed on it so that you never have to worry about loosing your bag again. Sure we showed you luggage strap before but most of them are not really for kids or adults that are young at heart. But now we found this luggage strap based on Frozen. 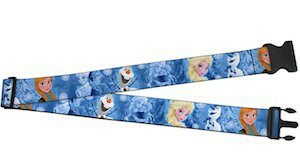 The strap is blue and shows picture of Anna and her sister Elsa and of course Snowman Olaf. This luggage strap is great for adults and kids suitcases and will make it easier to spot and of course way more fun because it has the Disney characters on it. The Frozen luggage strap can be adjusted between 41 and 74 inch so lots of luggage that fit in that size range.